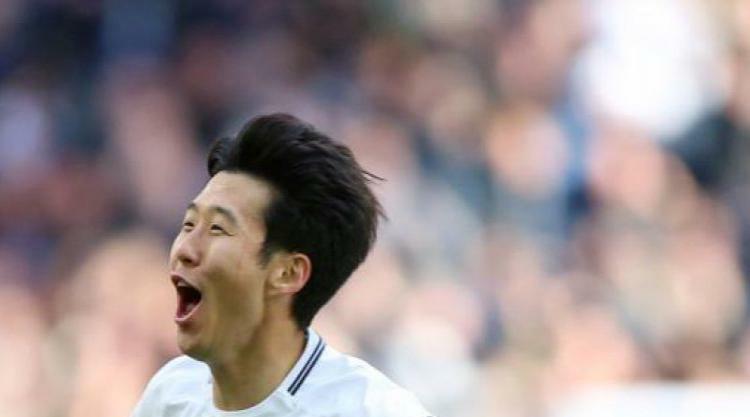 Son Heung-min has admitted his silencing celebration was pointedly aimed at West Ham's fans after his 30-yard stunner rescued a 1-1 draw for Tottenham at Wembley. After cancelling out an equally spectacular long-range strike from Pedro Obiang, the South Korean instantly ran over to the away supporters, with his index finger to his lips. Son would not go into details after the match, but it is understood he was likely reacting to an ugly incident in November, which saw him racially abused by a West Ham fan near Tottenham's training ground. The perpetrator videoed the exchange through his car window as he asked Son for a "copy of the new Planet of the Apes film" before adding: "You do DVDs" and "Yeah, West Ham you w*****." Asked about his celebration on Thursday, Son said: "It was nothing special, I don't want to talk about it. But I think they knew why I did it and that's it." Son, who is an immensely popular member of the Tottenham squad, was also subjected to chants of "DVD" by Millwall supporters during the clubs' FA Cup quarter-final last year. He scored a hat-trick that day and the 25-year-old's response against West Ham was similarly emphatic, as Spurs avoided what was almost a galling defeat to their east London rivals. Obiang's soaring 70th-minute shot was West Ham's first on target in the match before Son hit his sixth goal in nine games, and 10th of the season. "This is my dream, I'm living my dream but I can't believe it," Son said. "I think I can still play better of course. I am still getting better if I work hard. I have a good chance to play even better than this." West Ham's new-found resilience under David Moyes was on display again as they extended their impressive recent run against the top clubs. Since the Scot took over, the Hammers, now 15th, have lost only narrowly to Manchester City, beaten Chelsea and drawn with both Arsenal and Tottenham. "Something has changed," Obiang said. "When we start the season in that situation [against Manchester United], the first game we lost it 4-0. "This year we already have four points and we have to continue in this way." Both sides now turn their attention to their FA Cup third-round ties on Sunday, when Spurs host Wimbledon and West Ham travel to Shrewsbury. With City almost out of sight at the top of the Premier League, the FA Cup would seem to represent Tottenham's best chance of ending their 10-year run without a trophy. "If we can win the cup that's going to be good for the club because I think it's been a long time since we won a trophy," Moussa Sissoko said. "Of course, we can [go far]. We have a massive team and a strong squad. We can compete with everyone and we have to show it on the pitch. That's what we will do." Tottenham have also ended their interest in Everton midfielder Ross Barkley, who is set to join Chelsea. Press Association Sport understands Spurs were prepared to match both the transfer fee and wages Chelsea have offered for Barkley, but manager Mauricio Pochettino decided not to continue his interest from last summer.